It's time for another reveal! 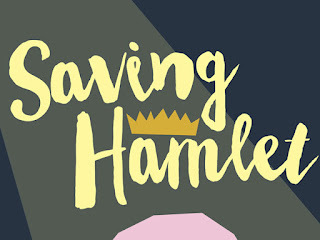 We're so excited to share the cover of Molly Booth's debut YA novel, SAVING HAMLET -- which features Shakespeare, Shakespeare dorks, and surprise time travel. 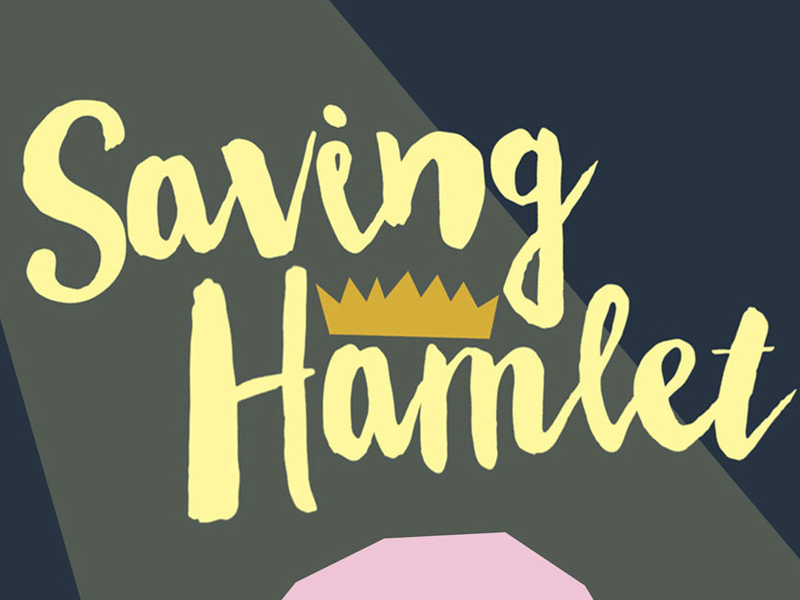 Saving Hamlet by Molly Booth will be coming November 1st, 2016 from Disney-Hyperion. The same year as Shakespeare's 400th birthday/deathday! 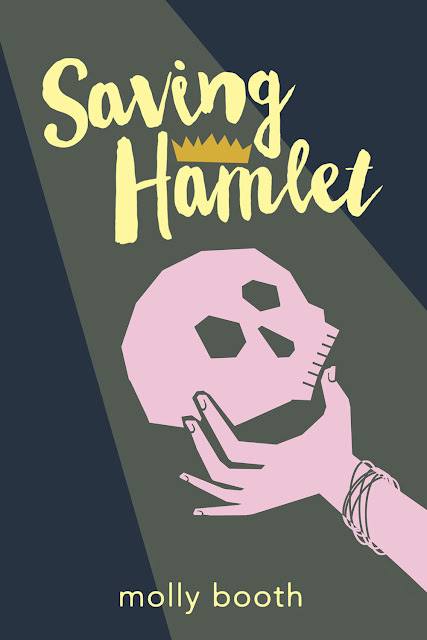 Saving Hamlet stars Emma, a teenager who’s working on her high school’s production of Hamlet -- and falls through the stage trap door, into the basement of The Globe Playhouse in 1601, just as Shakespeare is producing the original show. Both Hamlets are disastrous, and it falls to anxious Emma, Shakespeare dork and newbie stage manager, to pull them together. Saving Hamlet has a cast of characters representative of the real world, and looks to ask the question: how can literature help us understand ourselves and the people around us? Also, so many crushes. Before I got my book deal, I’d read so many author interviews that said I wouldn’t get any say in my book’s cover. I was all prepared for that to be the case. But my experience with SAVING HAMLET’s cover design has been awesome! My designer at Disney-Hyperion, Tyler Nevins, just got the book. I’d daydreamed about SAVING HAMLET’s cover: I wanted it to reflect the narrative’s classic literature roots, but also show Emma’s funny, sarcastic personality. I envisioned kind of a punk-y, modern twist on Shakespeare imagery. Tyler somehow read my mind, and he created this fantastic cover. I love it. I haven’t seen any other cover design like it. To me, the illustration feels like a high school play poster, which is perfect, given that the book is about high schoolers producing Shakespeare! I think the style is one I’d like to stick with for future books. I’m so grateful to Tyler, my editor, Kieran Scott, and the Disney-Hyperion team for creating a cover that feels true to me and Emma’s story. I can’t wait to feel this book in my hands. I’m going to hug it forever. Because I’m an enormous nerd. Most of all, I can’t wait to share it with readers!! Molly Booth writes books about Shakespeare and feelings. She’s repped by the indomitable Alex Slater at Trident Media Group, and edited by the brilliant Kieran Scott at Disney-Hyperion. 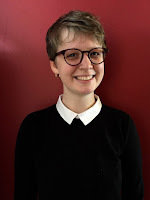 Molly grew up homeschooled in Massachusetts, and wrote her first book, SAVING HAMLET, at Marlboro College in Vermont. She also writes for kickbutt websites like Hellogiggles and The Mary Sue. And she spends a lot of time re-reading Tamora Pierce novels, taking pictures of her pets, and playing dorky card games with her herd of siblings. She’s hard at work on her second book, another Shakespeare dork-a-thon. Visit Molly online and nerd out together! Love that cover! And love the premise of this book!